Blogging this month will be inspired by a fact of some sort that I uncovered while writing Darcy and Elizabeth: Hope of the Future. Today, from a chapter where poor Mr. Darcy attempts to shop for Elizabeth. Lost amongst the vastness of Harding and Howell, he is assisted by three women of influence. The early years of Maria Davison are somewhat of a mystery. She was born in 1780, possibly, in the Liverpool area, maybe, to acting parents unknown other than their last name, which was Duncan. Growing up surrounded by performers, Maria Duncan began her career as a child on the stages of Liverpool, Dublin, Edinburgh, and Newcastle. Fortunately for the ambitious Maria, she caught the eye of Tate Wilkinson, manager of the rising York theatre circuit. For some five to six years she gained in popularity, and is still treasured as one of the greatest dramatic genius to ever rise from the northern theatre circuit. She received numerous offers from London theaters, Maria turning them down due to her tremendous love for Scotland and the north. In 1804 she performed in Margate, Kent for over a month. So rapturous were the accolades, the manager of Drury Lane offered her a substantial sum to play Lady Teazle in The School for Scandal. It was the beginning of a magnificent career. In her first season alone she played over a dozen leading ladies. On January 31, 1805 she “created” the role of Juliana in The Honeymoon, the character she is most famous for. She was with the Drury Lane company for fourteen years, and was loved by audiences everywhere. On October 31, 1812, she married James Davison, thereafter appearing on the Drury Lane stage as Maria Davison. Her first appearance at Covent Garden was on September 8, 1819, again as Lady Teazle. She would return to Drury Lane the following year, in October, as Julia in The Rivals, for one night only. Over the course of the subsequent ten years, she played a host of roles at several London theaters, the last noteworthy turn as Mrs. Subtle in Paul Pry in 1828. Her final acting years are as mysterious as her beginnings, the mentions vague and unsubstantiated. She lived for many years in retirement, quietly with her husband, until her death on May 30, 1858. Marie Thérèse Du Camp was born in Vienna on January 17, 1774, the eldest of the six children of George Lewis De Camp, a musician, and his wife, Jeanne Adrienne Dufour, a dancer. Brought to England at a very young age, she appeared when only six at the Opera House, playing Cupid in a ballet by Jean-Georges Noverre. After a series of theatre performances as a child, including at the Royal Circus and Haymarket Theatre, she debuted at the Theatre Royal, Drury Lane in 1786 when only twelve, as Julie, a minor part in John Burgoyne’s Richard Cœur de Lion. As Maria Du Camp, true success and public fame began with her 1792 appearance at the Haymarket as Macheath in Beggar’s Opera. Thereafter, a string of acting and singing performances followed, some minor and others major. While respected and garnering solid reviews, Maria would never attain the highest status of a supreme actress. On July 2, 1806 she married actor Charles Kemble, the youngest brother of Sarah Kemble Siddons. As Maria Kemble, part of the famed acting family, she moved to Covent Garden. Her first appearance was on October 1, 1806 as Maria in The Citizen. Until her retirement from the stage in 1819, Maria remained at Covent Garden, often performing with her much more famous husband. A solitary reappearance was made at Covent Garden on the occasion of her daughter Fanny Kemble’s debut as Shakespeare’s Juliet on October 5, 1829. Maria played Lady Capulet. Maria bore three children to Charles Kemble. Their daughters Fanny Kemble and Adelaide Kemble chose the acting profession, following in the footsteps of their parents and extended family. Only their son, John Kemble, chose another calling, becoming a renowned classical scholar and historian. Maria Kemble died on September 3, 1838. Sarah was born in Brecon, Wales on July 5, 1755. The daughter of actor and stage manager Roger Kemble, and actress Sarah Ward, acting was, literally, in her blood. From a very young age, Sarah was appearing in her father’s traveling stage shows. These small troops of a dozen or so actors performed in the courtyards of country inns and market squares. Far removed from the stages of London! By the time Sarah was in her teens, she was an experienced performer, despite her parents attempting to discourage her from pursuing what was then considered a disreputable profession for a female. For the subsequent six years, Sarah worked in provincial companies, such as the Old Orchard Street Theatre in Bath. Her performance improved as did her acting skill. Building her reputation gradually, Sarah once again gained Garrick’s attention. On October 10 of 1782 she appeared on the Drury Lane stage as the star. Playing the title role in Isabella, or, The Fatal Marriage, Sarah Siddons was an instant sensation. Her most famous role was that of Lady Macbeth. It is written of her performance that the grandeur of her emotions, as she expressed Lady Macbeth’s murderous passions, held her audiences spellbound. In Lady Macbeth she found the highest and best scope for her acting abilities. She was tall and had a striking figure, brilliant beauty, powerfully expressive eyes, and solemn dignity of demeanor which enabled her to claim the character as her own. She played many roles during her tenure at Drury Lane, including Desdemona, Rosalind, Ophelia, and Volumnia, all with great success. However, her personal favorite was Queen Catherine in Shakespeare’s Henry VIII. Acting, and the fame which she gained, was more important to Sarah than marriage or motherhood. She bore seven children to William Siddons, only two who outlived her. Over time the marriage grew strained, eventually ended in a formal separation. In 1802, Sarah left Drury Lane for Covent Garden, appearing on and off for ten years, her acclaim only growing stronger. On June 29, 1812, at the age of 57, Sarah held her final performance, as Lady Macbeth, of course. The public was said to be so moved that they refused to let the play go on after the sleepwalking scene, where Lady Macbeth makes her final appearance. The curtain had to be closed and, when it reopened, Sarah was sitting in the middle of the stage, dressed in her own clothes, and addressed an emotional farewell speech to the crowd that lasted almost ten minutes. 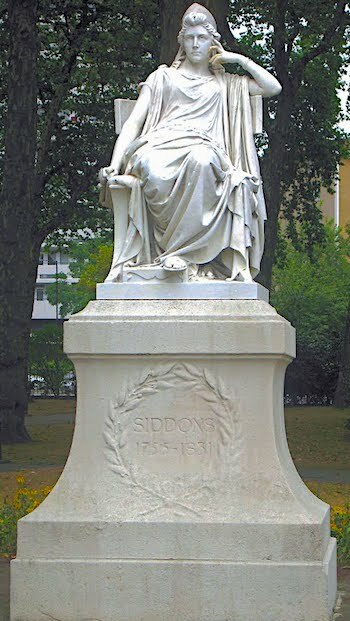 The lure of the stage called from time to time, Siddons appearing upon occasion until her true final performance on June 9, 1819. When she died on June 8, 1831, acclaimed as the greatest actress the world had seen to that point, over five-thousand people attended her funeral. She is interned at St. Mary’s Cemetery in Paddington. I don’t think you mentioned that Sarah Siddons and Marie-Therese Kemble were sisters in law. I had heard of Sarah Siddons but not the other two. Interesting. Thanks for the history lesson.